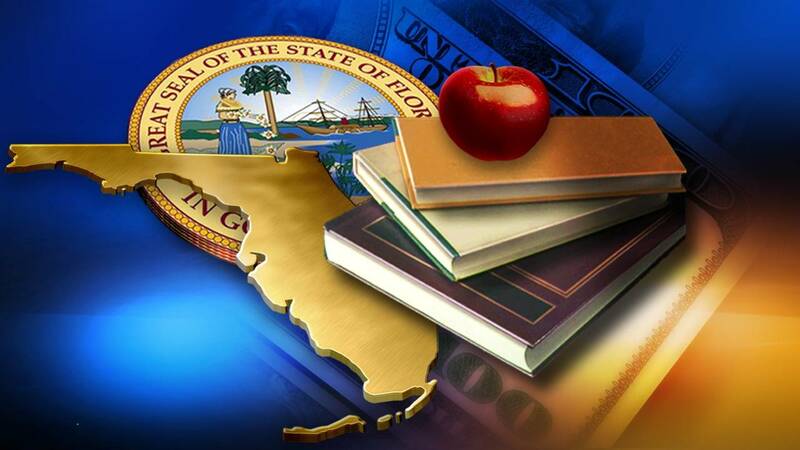 TALLAHASSEE, Fla. - The Democratic and Republican candidates for governor on Tuesday launched competing plans to improve Florida’s schools. In a news conference in Tallahassee, Democrat Andrew Gillum defended his proposal, first announced in January, to provide a minimum $50,000 starting salary for teachers by increasing the state corporate-income tax by $1 billion. Republican Ron DeSantis released a detailed education plan, including a measure that would require 80 percent of school funding to be spent in classrooms and not on administration. He said the plan could help boost teacher pay. Republicans have been criticizing Gillum’s plan to increase the corporate-income tax rate from 5.5 percent to 7.75 percent to raise $1 billion for schools, providing money for teacher pay and early-education programs. Gillum, the Tallahassee mayor, said only the largest corporations pay the tax because of exemptions, estimating his proposal would impact about 3 percent of the companies doing business in the state. He said the increase would be offset by more than $6 billion in reduced taxes the corporations are paying because of the recent cut in the federal corporate tax. Gillum called it “an embarrassing indictment” of the state that Florida teacher pay ranks 45th among the states and that salaries are $12,000 below the national average. “I don’t buy that argument. It’s a red herring,” Gillum said. But Republicans slammed the tax plan. After touring the Okaloosa STEMM Academy in Valparaiso on Tuesday, DeSantis said his plan could boost pay for teachers. “As we’re moving away from bureaucracy and putting more of the percentage of money we spend into the classroom, to me, the primary beneficiary is going to be the teachers,” he told reporters. DeSantis said he also wants to revamp teacher bonus programs and make them “more reflective of what you’re doing in the classroom.” He said he would support changing the current “Best and Brightest” program that has awarded bonuses based on teachers’ SAT and ACT college-entrance scores. DeSantis also called for a review of curriculum standards now used in schools and said he wants to work on a provision that would require “constitutional principles” be taught as part of civics education. He also said he would support a constitutional amendment imposing term limits on local school board members. DeSantis’ “80 percent” plan is similar to a measure advanced in the Florida House more than decade ago, with lawmakers setting the classroom percentage at 65 percent. But the proposal failed in the Senate, in part, because of the difficulty of identifying funds spent inside or outside the classrooms. “Aside from the fact that the scheme flies in face of local control of schools, it is a political gimmick that other states have tried and abandoned,” Joanne McCall, president of Florida Education Association, the major teachers’ union, said in a statement. In a clear difference with Gillum, DeSantis also said he would work to expand education “choice” programs, including the use of corporate tax credits that sent more than 108,000 students to private schools in the last year. DeSantis credited the voucher-like programs for Florida’s recent success in national testing measures, including the National Assessment of Education Progress, and for its rising high school graduation rate. Gillum vowed to end “the voucherizing of the education system” that began under former Republican Gov. Jeb Bush. --- This report includes information from David Bishop of FLA News.